Wash and dry medium-size summer squash. Let's assume 2 pounds, about 4-5 medium squash, heavy enough to offer some bulk, but not large enough to have noticeable seeds. Do not peel the squash. Slice across the squash to make circles, each about 1/8 thick. If a circle is bigger than a silver dollar, slice it in half. Heat an iron skillet, and add bacon fat, lard, or (now that it's 2010) a high-heat oil like grapeseed. Heat until you can see a kind of shimmer in the fat, and you can smell it. Adjust the heat to medium. Carefully add the squash, and sprinkle with salt and pepper. After the squash circles brown a little on one side, about five minutes, turn them over, and add about 1 heaping Tablespoon unbolted white cornmeal. Let cook another three minutes, and then stir occasionally until most of the squash slices and the specks of cornmeal have light brown edges, about five minutes more. Two excellent edits to Mother's Crunchy Summer squash: Dice the squash in 1/2 inch cubes, creating more surfaces for light caramelization. Peel and chop a medium onion, any type, in dice that roughly match the squash cubes. Before you put the squash in the hot oil over medium heat, cook the onions for two minutes, stirring often. Add the squash, and continue from step 4 above. Wash and chop about two pounds yellow summer squash into rough bite-size chunks. (Do not peel the squash.) Put the squash in a medium-sized saucepan with a heavy bottom. Add milk, enough to reach about half-way up the squash in the pan. Sprinkle with salt, and add a knob of butter. Watch carefully as you bring the liquid to a boil over medium heat. (The milk may be tempted to rise up and boil over, or it may be inclined to stick or burn on the bottom, so stir and watch during this phase.) Once the boiling begins, reduce the heat to medium-low. Stir well. Cover and cook until the squash is tender, about 8 minutes. Serve. Edits for this simple dish: Sprinkle with finely chopped fresh parsley, nutmeg, or cinnamon before serving. Add a tiny pinch of sugar. These two ways of cooking summer squash use what Appalachian cooks like my grandmother had on hand. Either dish could be on the stove within minutes of coming in from the morning's work, ready for midday dinner minutes later -- and these same virtues apply to getting evening dinner on the table after a full day's work. 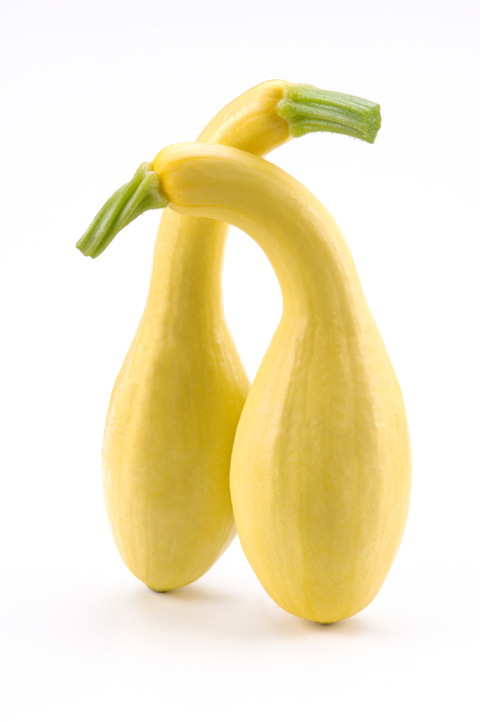 The dishes yield two dramatically different tastes and textures based on the no-drama crookneck squash. The two variations surely helped mild, homegrown summer squash keep its welcome at crowded dinner tables during its relatively long fresh season. We might call these "heritage" recipes. Whatever we call them, I like these simple tastes. The world is coming to visit central Kentucky this year for the Alltech FEI World Equestrian Games. To help our visitors know more about Kentucky's food and food ways, Savoring Kentucky is rolling out 116 Savory Kentucky Bites, one for each of the 100 days before WEG begins, and 16 for the days during WEG, September 25 - October 10. Today's Savory Bite is number 53.